The Creator on show in Cafe Ollo, Huddersfield Media Centre, one of the venues for the HOST preview week trail 2013. 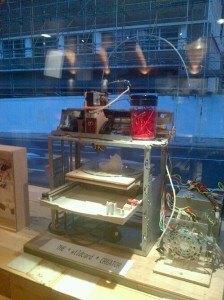 Here the 3D printer functionality of the sculpture was turned off so as to allow the sculptural aspects to dominate the piece. The Thinker at the Fountain.